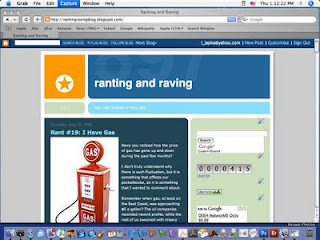 To build some type of traffic for my relatively new Ranting and Raving blog site at http://rantingravingblog.blogspot.com/, I have decided to publicize it through the Colgems site. Ranting and Raving is a place where I vent my frustrations with the world as I see it, and I definitely invite all of you to do the same too. I talk about a lot of things at this blog that I would never bring up here, including President Obama, the state of music and television, and gas prices. It's actually a fun blog, and I post at least five times each week. If you are looking for a place to (electronically) scream at the top of your lungs, this is the place to go to, each and every day. And again, sorry for the cross-pollination, but I feel it is another way for me to boost visits to this new site. Here is this month's Colgems upload, the stereo version of The Monkees' debut album. The success of this album propelled Davy Jones, Micky Dolenz, Peter Tork and Mike Nesmith to the top of the pop charts. There was much controversey when this album came out. It was well known that the group did not play on every song on the album, even though the TV show gave viewers the impression that they performed instrumentally on each and every song. The controversy was kind of bogus. With the schedules that most bands had at the time--concerts and recording--it was very rare for groups to perform instrumentally on every song. The Beach Boys certainly didn't, and even the Beatles had used a drummer other than Ringo on an occssion or two. However, the Monkees' situation was quite different. With the foursome being a group created for a TV show, the usual rock band pressures were multiplied, as the group not only recorded and had concerts, but they also had a TV show to do. 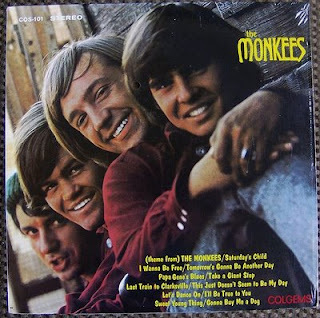 In order to cash in quickly, studio musicians were used on all the tracks on this album--although the Monkees did perform instrumentally on some of the tracks. Nesmith and Tork did play on some tracks--primarily Nesmith's two offerings, "Sweet Young Thing" and "Papa Gene's Blues"--and Dolenz is also supposedly on some tracks. Jones, not much of a musician but a solid stage performer, might not have played on any track, although his voice--and Dolenz's--are heard throughout the album. Although the best was yet to come, this debut album certainly stands as one of the best "first" albums in rock history.